Downtown Santa Fe, NM, has so much to offer. You can spend hours exploring the traditional adobe buildings while browsing local shops and trying out new cuisine. Even more adventure is to be had outside the city! Hiking is the perfect way to explore the beautiful mountain views found on the outskirts of Santa Fe. The Atalaya Mountain Hiking Trail is a moderately challenging trail through the forest. At an elevation of almost 2,000 feet, you will see incredible views of Santa Fe below! Reach new heights and see Santa Fe like you have never seen it before. If you’re planning a trip to Santa Fe, our free Vacation Guide can help! It features recommendations on things to do and see during your stay, like exploring the Atalaya Mountain Hiking Trail. Vacation planning can be hard, so let Four Kachinas Inn make your vacation planning a little easier! The Atalaya Mountain Hiking Trail winds up the mountain for almost 6 miles. This is a moderate hike; while not an incredibly challenging, it is not easy. There are different routes that range in difficulty. These routes are well-marked with signs at every fork to point out the steeper from the easier route. You’ll climb through pinon scrub and rusty ponderosa pine before reaching the top where you will be rewarded with incredible views of Santa Fe’s adobe spread. This magnificent hiking trail was named “Atalaya” because it means “watchtower” in Spanish. When you make the trek, you’ll see why! You’ll want to take a break to enjoy the breathtaking scenery while you rest before making the descent back to the bottom. While the most important thing to bring on your trip up the Atalaya Mountain Hiking Trail is your sense of adventure, there are a few other items that are useful! Sneakers or boots are definitely a must. While the trail is not considered extremely challenging, proper footwear is important for your safety. Also make sure you bring a water bottle or two to stay hydrated, especially during the hotter summer months. Lastly, when choosing trails, many choose to take the more challenging routes up the mountain and the easier routes down. This means that the trail is not as steep, therefore much easier to descend. private patio to continue enjoying the outdoors, like the Zia Room. Let the accommodating staff place a bottle of wine and some cheese and crackers in your room to indulge in when you get back from your hike! After you have fully relaxed, rest in your comfortable room and then wake up the next morning to an incredible homemade breakfast. The buffet-style breakfast is prepared with fresh ingredients in our kitchen each morning and features an assortment of home-baked goods, a hot entree, fresh fruit, cereals, yogurts, juices, tea and freshly brewed coffees. 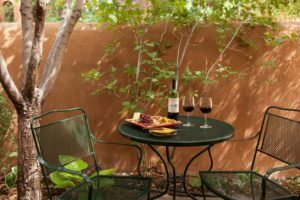 After starting your day with an incredible meal, you’ll be ready to explore the rest of Santa Fe!